Atlas Quest: The calendars are IN the mail! Yesterday evening, I posted a message to let everyone know the official AQ 2007 Letterboxing Calendars had arrived, and I was frantically packing them up for shipping today. This morning, though, I realized I was four envelopes short of what I needed. So off I walked to a nearby drug store (Bartell's, if you need to know) to pick up a few. Oh, the adventure!!! I walked through a small alleyway to get to Bartells rather than the drive-in entrance, and was a bit surprised to see what seemed like a hundred high school students coming from Jack In the Box walking along with me. What is this? A mob or something? Just outside of Bartell's, though, it suddenly became clear. It was a fight! Two kids put up their dukes and circled each other menacingly before they took a couple of swips at each other. One of them got hit pretty hard and he practically started hugging the other guy, then they both crashed to the concrete ground rather hand. It was sad. Such a stupid thing to be doing. I didn't even stop to watch--I watched what I could while walking past and entered into Bartells telling the lady at the front counter that there was a fight going on outside and it might be prudent to call the police. Her eyes opened wide, and she said she noticed all those kids walking past and was wondering what was up, and prompted told all the other employees about the fight going on outside asking if she should call the police. I continued with my shopping, but most of the employees went outside to watch the fight. I picked up five envelopes large enough for the calendars (I only needed four, but I figured having an extra one around wasn't a bad idea) and when I came back to check out, the lady I first told about the fight was on the phone with the police (or at least a 911 operator--who mans those things anyhow?) giving all of the pertinent information about the fight. One of the other employees who'd gone outside to watch came back in to say that they were "taking it to Jack In the Box to finish" and looking outside, I could see the mass of hundred or so students walking in that direction. I finished my purchase, and the lady at the counter thanked for me letting them know about the fight. I told said I just happened to be passing by (which was the truth) and it looked like someone could get hurt pretty badly, but there was no way I was going to break up a fight with a hundred hormone-challenged kids egging it on. Speaking of which, I thought you might enjoy seeing the piles of calendars ready for shipment. 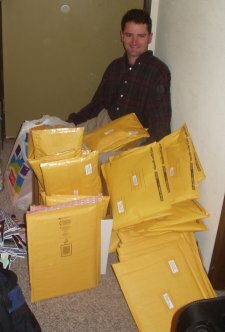 That's the main reason I created this particular blog entry--to show off the picture of me sitting behind all the orders I have packed and ready to go. Needless to say, I didn't carry all of these to the post office on my back--there was just a little too much for that. I actually packed up my car and drove (*gasp! *) to the post office. I carried as much as I could, stood in line until it was my turn. "You've been busy, have you?" the postal clerk asked me. "Yep, and there's more in my car," I replied. He waved me off saying to go get the rest and he'll get started on what I brought in already, and it took three more trips to the car to get all the packages. It took awhile for him to key in all the orders, and during a brief period when there weren't any others in the post office to mail stuff, I gave a stack of orders to a second person and had the two of them working to mail off all the items. =) I worked on filling out customs forms for the international orders while they were typing in the domestic shipments. 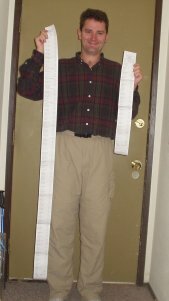 After returning to Amanda's place, I had her take a picture of me with the receipts from the post office. The shorter one is from the guy who helped the first postal clerk with some of the orders. The total bill came to $311.82--just in case you were curious. And that's all I have to write. For now..... Happy trails!